What would Papa Hemingway eat? One hundred and 16 years after his birth, and 54 years after his death, Ernest Hemingway hasn’t lost his allure. Over the past year, Papa’s life or works have inspired three local restaurants. 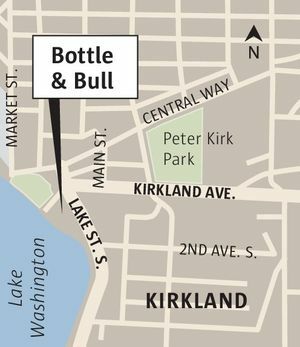 Wallingford’s Manolin is named for a character in “The Old Man and the Sea.” Ernest Loves Agnes, a 2-month-old Italian restaurant on Capitol Hill, pays homage to the real-life love affair behind “A Farewell to Arms.” Kirkland’s Bottle & Bull nods to two of the legendary writer’s many passions: bullfighting and imbibing. “Hemingway was a prolific drinker and an avid traveler,” says ex-UW English major Jessi Pricco, co-owner of Bottle & Bull with her husband, Chad Waldher. That gives them plenty of creative license when it comes to food and drink, but it makes for a menu hard to pigeonhole. Despite a smattering of Spanish, French and Italian influences, like Hemingway, it’s American at heart. Hours: dinner 3-9 p.m. Tuesday-Thursday; 3-10 p.m. Friday-Sunday; late-night menu 9-11 p.m. Tuesday-Thursday, 10 p.m.-2 a.m. Friday and Sunday; brunch 10 a.m.-2 p.m. Saturday and Sunday; happy hour 3-6 p.m. Tuesday-Friday, 2-6 p.m. Saturday and Sunday. Closed Monday. Drinks: full bar; original and classic cocktails; Northwest and imported beers; brief wine list, all selections poured by the 6-ounce glass. One can readily imagine Papa knocking back a few daiquiris in this softly lit den, perhaps commanding a corner booth to regale friends with war stories or tales of the hunt, or brooding alone in a cushioned swivel seat facing the ornate pillars of the antique Brunswick back bar. I don’t know whether he would enjoy the Snows of Kilimanjaro cocktail, but I sure did. It’s a drink ideal for the Pacific Northwest’s rainy winter chill. Built with Copperworks Navy-strength gin, Cocchi rosa and Lazzaroni amaro, it’s fruity and floral, with bitter balancing sweet, smoothed by aging in a single malt barrel. I also appreciated such faithfully rendered classics as the Pegu Club and the Sazerac. The kitchen ventures beyond pub food with varying success. The menu’s strongest “chapters” are starters, small plates, sandwiches and salads. Flatbreads and entrees could use some revision. Duck confit flatbread, one of three versions offered, emerged from the leaping flames of a gas-fired oven with crust as pale as a saltine cracker. Perhaps the oven temp wasn’t what it should have been that night; chocolate stout cake baked in a cast iron skillet was also undercooked. The oven did right by a juicy smoked pork chop, paired with crusty pork belly squares and a deep-fried pork confit croquette. But with all that rich meat, I wanted a sharper bite than the side of mustard-braised cabbage delivered. That pork dish — along with soggy pan-seared scallops made wetter by a thinned, ginger-citrus aioli — is among a handful of “substantial” plates that leap in price $10 or more over the rest of the menu. Smaller plates with a tighter focus were more successful. Ordering a few of those to share is a good way to go. Start with pickled pink hard-boiled eggs, steeped in beet juice, capped with a swirl of smoked-salmon mousse, a halo of pickled shallot and flakes of dried fennel fronds. It’s the sort of elegant bite that might be served as an amuse-bouche at a fancier place, say Canlis, where executive chef Bryan Casey was once sous chef. Casey was a midsummer replacement. Not all his food is so highfalutin. Among the new dishes he introduced is a hot, zesty smoked cod dip that would be at home at a neighborhood potluck. 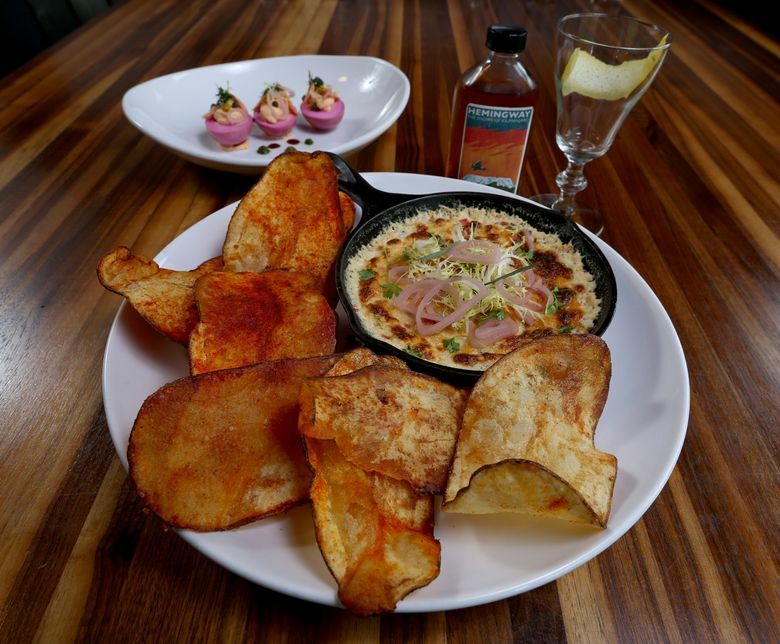 With it are fantastic house-made potato chips, cut lengthwise from large bakers and dusted with salt and smoked pimento. They make the stubby truffle pommes frites look like wimps. The frites accompany the Cubano sandwich and the house burger. Though the burger’s brioche bun can’t quite hold it together after absorbing all the meat drippings, the condiments — tangy tomato confit and crisp zucchini relish — are a refreshing departure from lettuce and tomato. Challah is the bread of choice for the Cubano. Their version, pressed like panini, involves ham, roast pork, Gruyere and a dab of smoky barbecue sauce along with the requisite mustard and pickles. A vibrant Romesco sauce blending roasted red pepper and almonds invigorates little pork-and-lamb meatballs. A hint of chile heat permeates the well-seasoned steak tartare, embedded with a raw quail egg and embellished with capers, pickled shallots, fresh herbs and scribbles of Dijon mustard. Parisian Parmesan gnocchi, constructed of pâte à choux pastry, not potato like their Italian cousins, are light yet durable enough to stand up to a rich red-meat sauce made with smoked wagyu beef. On the lighter side, you’ll find two wonderful salads. A gorgeous ensemble of wild watercress with citrus and avocado flaunted two kinds of radishes, breakfast and watermelon. Smoked baby beets with spiced pickled grapes, lemony ricotta and arugula struck a bolder chord. I can’t imagine Ernest ordering either one, but you should.